Bryce Canyon National Park is located in southwestern Utah in the United States. Bryce Canyon which, despite its name, is not a canyon but a giant natural amphitheater created by erosion along the eastern side of the Paunsaugunt Plateau. Bryce is distinctive due to geological structures called hoodoos, formed by wind, water, and ice erosion of the river and lake bed sedimentary rocks. Some of these hoodoos are up to 200 feet high. The red, orange, and white colors of the rocks provide spectacular views for park visitors. 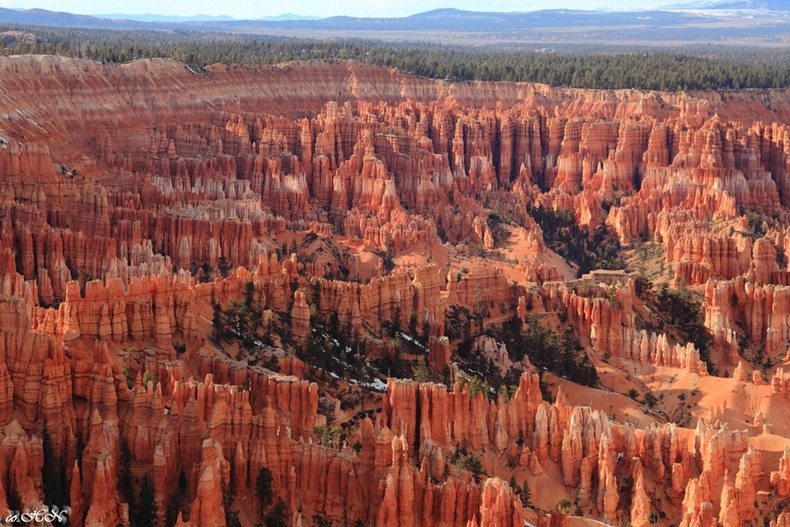 For millions of years water has carved Bryce's rugged landscape. Water drips into the cracks in the rocks, freezes and expands thereby splitting the rocks - a cyclic process that occurs some 200 times a year. In summer, rainwater etches into the softer limestones and sluices through the deep runnels. In about 50 years the present rim will be cut back another foot. Bryce lies at a much higher elevation than nearby Zion National Park and the Grand Canyon, varying from 8,000 to 9,000 feet (2,440 to 2,740 m), whereas the south rim of the Grand Canyon sits at 7,000 feet (2130 m) above Sea Level. Bryce Canyon National Park therefore has a substantially different ecology and climate, offering a contrast for visitors to the south west. The Bryce area was settled by Mormon pioneers in the 1850s and was named after Ebenezer Bryce, who homesteaded in the area in 1874. The area around Bryce Canyon became a U.S. National Monument in 1923 and was designated as a national park in 1928. The park covers 35,835 acres and receives relatively few visitors compared to Zion National Park and the Grand Canyon, largely due to its remote location.